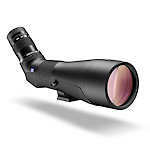 The Zeiss Conquest line premiers with the Gavia 85 Spotting Scope. It is 30-60x85 angled, with a magnesium alloy body weighing only 60 oz. including the eyepiece. The mount foot is compatible with any head that accepts a 200 PL quick release plate. The 10.8' close focus is best in class at the time of introduction.